North Korea displayed its military might with a huge parade Sunday 10 October 2010 to mark the 65th anniversary of the country's only political party. Heir apparent Kim Jong Un appeared with his father, absolute leader Kim Jong Il. With the event aired live on national television, North Koreans received their first extended look at the young man selected to be their next leader. Importantly, this marked the first public display of the No-dong-B intermediate range missile. This missile is a significant new capability, since it can be covertly deployed on small carge vessels in standard-sized cargo containers. Iran must be presumed to have the same capability, which would circumvent most American ballistic missile defense preparations. Hundreds of ships are switching off their tracking devices and taking unexplained routes, raising concern that the trafficking of arms, migrants and drugs is going undetected. New technology enables authorities to follow the routes of suspect vessels, but security experts say taking on the smugglers will require greater coordination. The North Korean and Iranian KN-07? & KN-11, No-dong-B/Mirim IRBM missile system derived from the Acad.FV. 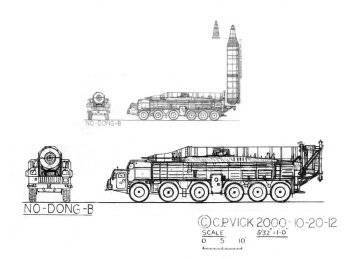 P. Makeyev OKB SS-N-6 missile systems technology transfer to the DPRK. The North Korean KN-07? & KN-11, No-dong-B missile transporter erector launcher TEL system as deployed in the DPRK. The Near Term Containerized Ballistic Missile Threat? Several seemingly unrelated bits of information reveals a potential new developing strategic threat from Iran and North Korea . For years it has been suggested that surface ship based ballistic missiles could threaten Western national security interest. The strategic advantage of such concepts is that the ship based systems could stand off from countries on the open ocean and not be seen or easily identified due to their stealth-ness commercial looks. Now the first evidence of hardware testing appears to indicate the early development of the required proof of concept technology to make this a reality from Iran and perhaps North Korea . When North Korea introduced the KN-11, No-dong-B into its land mobile strategic systems inventory in 2003 it was the first of several events that suggested such a concept might come into being via the cooperative efforts of North Korea and Iran . Now Iran has introduced the first hardware testing with North Korean assistance. Pending Container Ship Scud Threat? The Near Term Containerized KN-11, No-dong-B, Shahab-4 Ballistic Missile Threat? Steven J. Zaloga ["Sea Scorpion: A Poor Man's ICBM?" Jane's Intelligence Review, Nov 01, 1998, pp 5-7] proposed that the Soviet-era Sea Scorpion missile could make such a scenario extremely likely. Under the Soviet regime, the Scorpion missile was deployed on ships to increase the number of missiles while not interfering with submarine based missile development. Zaloga proposed that North Korea, Iran, Iraq and other countries could deploy less sophisticated versions of the Sea Scorpion, albeit with problems of accuracy and distance. By moving the launch vehicle -- the ship -- close in, distance (and to a lesser extent, accuracy) problems are mitigated. This was further examined by Richard Fisher, jr. of http://www.strategycenter.net/ on Sept. 20, 2004 in his paper “ North Korea ’s New Missiles”. 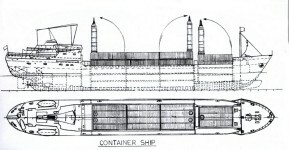 He suggested through his artist conceptual illustrations that such a ship based threat using the No-dong-B could be accomplished by using one or two stacked standardized shipping containers. Literally the containers would be broken apart and lifted vertically into position for launch. This was an interesting study but it was flawed because it had not considered the equipment interference, clearance and mass issues that are involved. While developing this study I considered variations on this study called concept-II. On 09 December 2002 the 3,500-ton North Korean cargo vessel, So San, was stopped and boarded about 600 miles off the coast of Yemen. This happened during maritime interception operations (MIO) in the Arabian Sea conducted by two Spanish Navy ships, the Santa Maria-class Frigate Navarra (F-85) accompanied by the replenishment ship Patino (A-14). When signaled to stop, So San attempted to evade capture, forcing Navarra to fire warning shots across its bow. Spanish Special Forces troops then conducted a hostile boarding by helicopter and small boat. The boarding team later found 15 disassembled Scud missiles concealed by bags of cement, bound for Yemen. US military experts deployed in the area were called in to further examine the cargo. US Intelligence sources had been tracking the vessel since it departed its home port of Nampo in North Korean in mid-November 2002. US officials feared the vessel was heading for Iraq or another rogue state. After urgent talks between US and Yemeni diplomats, it was allowed to deliver the weapons. The ship was flying no flag at the time it was stopped and the missiles were concealed underneath a shipment of cement. The ship was being tracked by the United States since leaving North Korea and was apparently stopped by the Spanish at the behest of the US government. After determining a lack of legal authority to cease the missiles, the ship was allowed to continue on to its destination. The Yemeni government, which initially denied knowledge of the ship, promised that there would be no transfer of the missiles to another country or non-state actor. Also, Yemen had cultivated closer ties with the US in recent years by cooperating in the Global War On Terrorism. 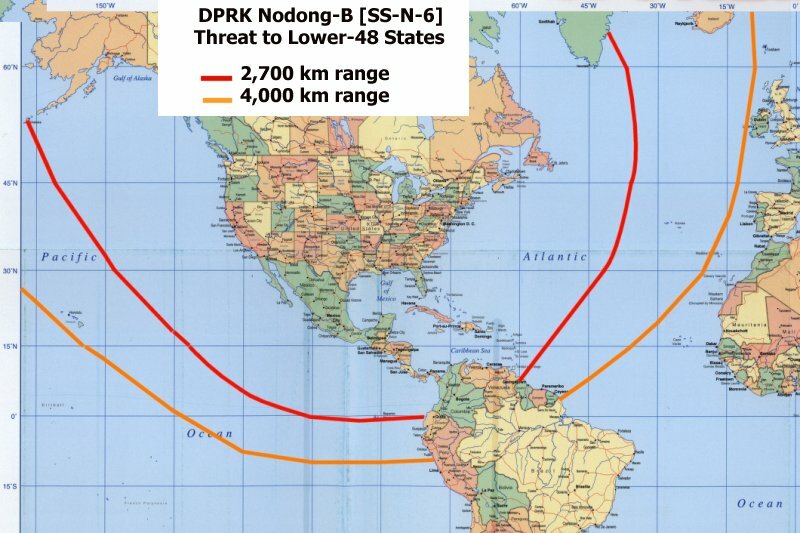 The incident raises the question of what US actions would be in the event of some kind of blockade aimed at preventing a North Korean merchant vessel equipped with a missile, such as the No-dong-B, from attacking the United States. The North Korean ship that transported Scud missiles to Yemen in 2002 was also used to carry chemical weapons material to North Korea. The Sosan delivered several tons of sodium cyanide, an agent used in making nerve gas, for use by Kim Jong-Il's regime. The Sosan sparked an international incident when it was stopped by US and Spanish warships in December 2002 close to Yemen. The Sosan later went on to Germany, where it picked up the chemical cargo before returning to the west Korean seaport of Nampo in February 2003. The Proliferation Security Initiative announced in May 2003, and the Pacific Command's Regional Maritime Security Initiative announced in March 2004, both appear to be aimed at providing the United States with the legal authority and practical ability to board and search ships at sea. This might entail a close quasi-blockade of North Korea, or it might entail enforcing an exclusion zone around the continental United States. This could entail monitoring very large stretches of open ocean, given the range of this missile, and it could entail monitoring very large numbers of ships, given the relatively compact size of this missile. Concept-II appears to offer very little room if any at all for a missile canister which this analyst dropped early on as excess mass not required but continued to reconsider it as a part of the erected container design. The erection of the canister for the missile was finally dropped because of the mass added that was not required. Erecting the container with out the canister with the missile held by the erector leaving the floor below in its foot print still requires a geared pin track to keep the rear end within the 40 foot by 8 foot area and the missile on its ring pad which still has to be raised some 6-8 feet with some mechanism. This concept adds to much mass load to the erector hydraulics of on the order of approximately 28,000 kgs verses the 19,000-21,000 kgs for the missile. A canister would add mass when there are only 5,740-7,740 kgs for all the added equipment including the erector various pneumatic electro hydraulic mechanical systems and the ground support equipment and pad elements. Further the container absolutely would interfere with the launch of the missile that almost certainly would collide with it during the first few unguided seconds of launch. Regardless of what design is developed it is a very tight tolerance design not leaving any room for excess mass or extra parts not needed. It must by necessity be a Spartan design stripped down to the bear essentials for certainty of feasible operability. 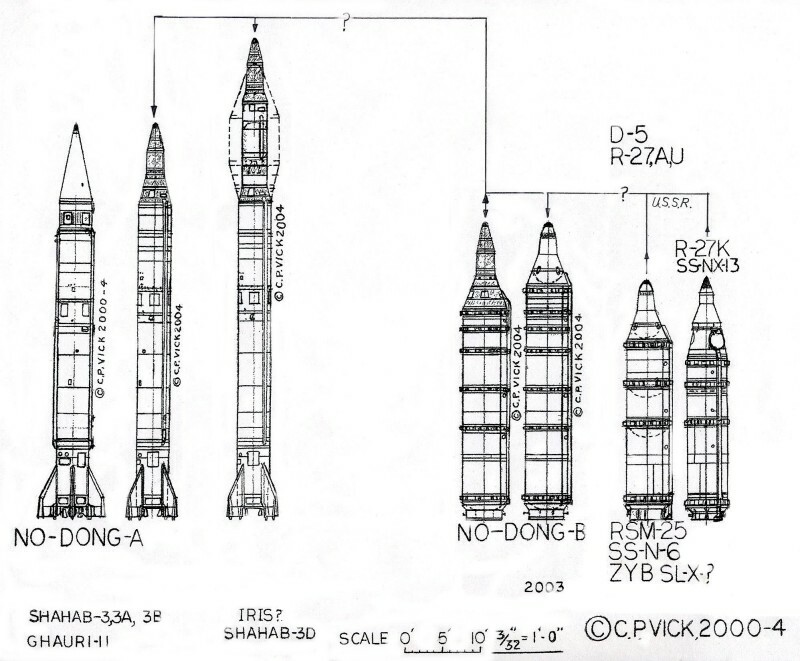 The former Soviet Unions logistic equipment for the SS-N-6, SS-NX-13 derivations was also studied. 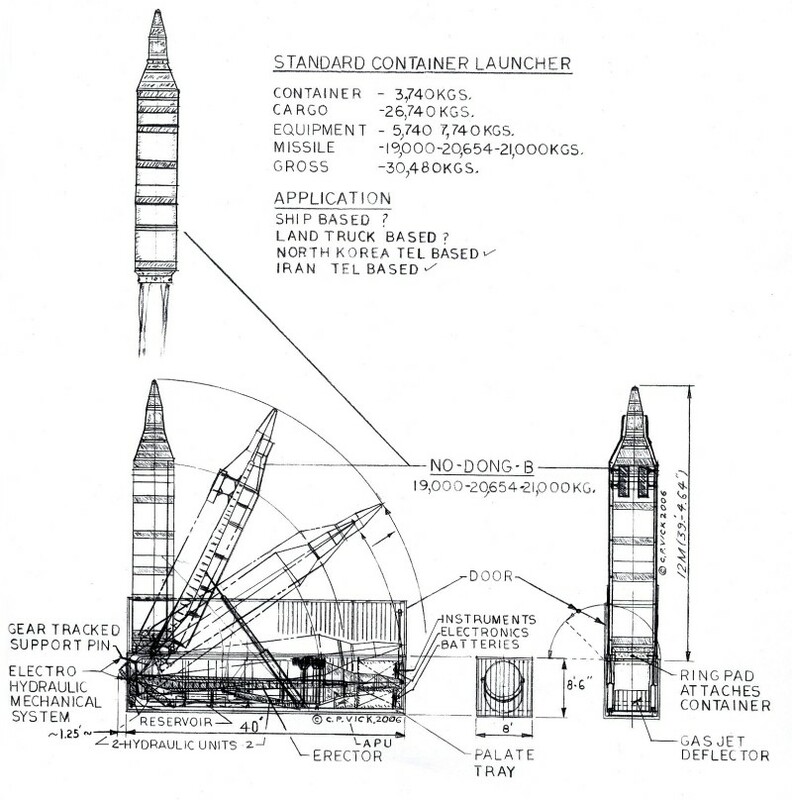 It was found that there are some related systems that are applicable for “palate tray” design transport and missile replenishment but that the Soviet hardware for the logistic for the SS-N-6 was done differently for different reasons making them essentially inoperable for this application. 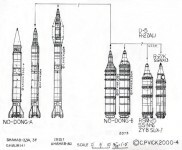 There were detailed technical problems with the analysis of the launcher erector system that was only resolved with the bear bones Concept-1. It must be remember that this launcher must remain within the foot print of the individual container and not interfere with other surrounding containers for it to be a viable operational system. This design is quite tight on its tolerance requirements to remain with in the 40 foot container. Otherwise this concept would not all together be viable. 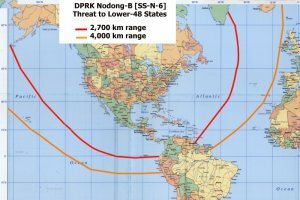 Study was conducted on the probable North Korean pad/TEL design which was seen separately by US imagery with the No-dong-B missiles. The missile was perhaps being separately transported on a Soviet heritage trolley or truck drawn system for its expected parading that did not take place. It is suspect that the TEL is a foreshortened variant on the No-dong-A concept seen in the flatbed truck package of Pakistan Ghauri-II missile TEL. It is clear that these factory pre-fueled fully loaded, armed and sealed missiles require a lot of support structurally until erected vertically on a pad or lowered into a underground tunnel silo canister facility in North Korea or Iran . Concept-I erects the missile by opening the top of the container hydraulically like a big door. The erector on its geared pin tracks is used to raise first the nose of the missile out of the container then raised the rear of the missile and its ring pad and pull the missile forward and vertically then the erector kicks in a second time arching straight up until the pad ring and struts have locked the pad into the containers walls structures with its gas jet flame deflector below. The missile is raised some 6-8 feet with the pneumatic electro hydraulic mechanisms on both sides of the missile pad. All of this is placed on a palate tray to place it in the container. This meets the bear bones mass requirements within the equipments 5,740-7,740 kgs mass schedule limits. No other concept meets this design requirement. It is assumed that the North Korean TEL uses this erector truncated design with a foreshortened TEL design similar to that seen in the Pakistani Ghauri-II/No-dong-A TEL design. In both cases the missile can not just be arched up to a vertical position but must be both arched up pulled forward and then have its rear raised by some 6-8 feet to the pad position clear requirements and only then can the erector raise the missile to the vertical position. All of the autonomous ground equipment instrumentation, electronics, APU power and fuel, batteries and hydraulics and its reservoirs are placed near the nose of the missile or under it or to its sides firmly attached to the base frame package palate tray. With both designs you have to remove the erector by lowering it part way to launch the missile. This all makes it possible to divert the gas jet down the lengthy of the container and all over everything. They may ultimately throw the container overboard after the launch but there would be burn marks as well as contaminates detectable from aircraft after a launch. The container can hold 26,740 kg of cargo with a maximum gross load of 30,480 kg with the container weighing 3,740 kg that leaves 7,740 - 5,740 kg for added equipment with a missile mass of 19,000 - 20,654 - 21,000 kg mass. Although a steel supported container on a railroad car can carry a total mass including itself of 120,000 kg this is not possible without special lifting support equipment because the container will break or crumble in the center of mass. Concepts are nice but until the details are worked out it is not real as this vividly illustrates. The conceptual small minimum class containerized ship considered for this threat analysis is of common Liberian registry with a length of 348 feet with a breadth of 48.5 feet and a depth of 27.9 feet utilizing a draft of 23.1 feet. The ship can reach as much as 12 Knots over 6,000 nautical miles range. It Gross registered mass is about 3,493 tons with a cargo capacity of 4,800 DWT, costing around $895,000.00. 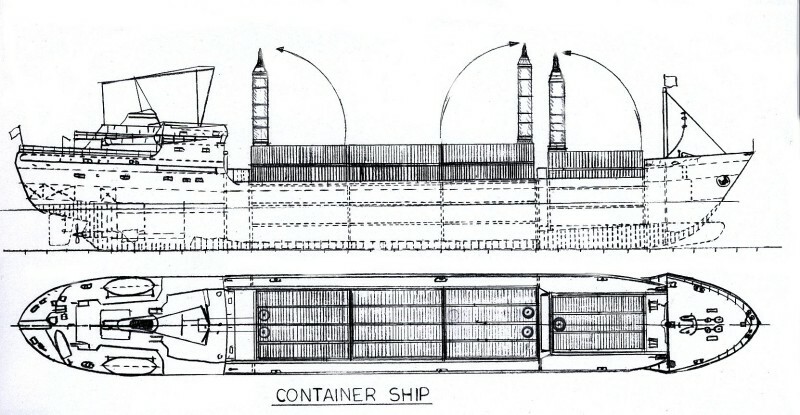 This is a conceptual composite design revision reflecting several design features of this class of container transport ships. Up to five missiles along the ships centerline could be launched from this container arrangement. With up to 6 ships distributed evenly in the Atlantic , Pacific and Gulf areas could launch as many as 30 warheads in a single salvo period followed by more if the containers used are dumped overboard. Three missiles are shown but up to five are possible with this design per ship. This is a potential substantial threat to the United States . If the North Koreans and Iranians very carefully place the containers in certain positions this operational threat becomes technologically conceivable. Further both North Korea and Iran have had time enough to work this out and to have prepared if not completed its initial preparation for potential near term deployment. Whether this has happened is uncertain but it is a potential strategic threat of the near term possibility.